Videos of a fireplace to put on your TV or computer screen this time of year is nothing new. You can even find a few on Netflix. Even without the added benefit of providing heat, they’re relaxing and make wherever you are feel more like home. If you’re a geek looking for a nice cracklin’ fire to put on in the background while working or hanging out with friends and family, Marvel has you covered. 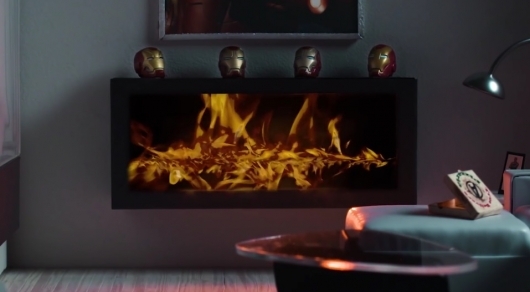 They’ve released a collection of videos of the fireplaces in various Marvel heroes’ homes. 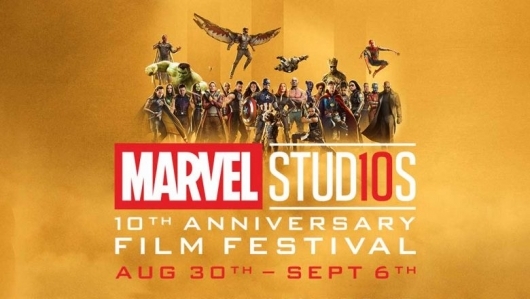 Each is just over an hour long, and includes Captain America‘s Brooklyn apartment, Ms. Marvel‘s New Jersey home, Thor‘s Asgard home, Iron Man‘s Manhattan apartment, and the Guardians of the Galaxy‘s spaceship and its fancy futuristic fire. There’s also a second close-up version of each of these. Find your perfect geeky fire below. Comic books have had a huge impact on superhero movies. We really wouldn’t have the Marvel Cinematic Universe without them. But just as they have an impact on the big screen, they can also bring out social and progressive change. 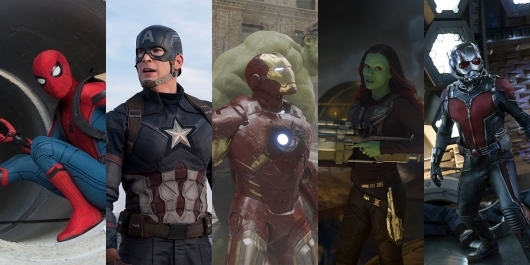 In recent years we’ve seen Marvel pull in to express diversity in gender and race. Sam Wilson became Captain America, and Jane Foster became Thor. Both were significant (and very welcomed) changes for the comics. But with comics, nothing is ever permanent. Characters who died can come back to life. Enemies are now allies. And revelations are sometimes controversial, like when Captain America and Hydra controversy, which was then resolved a few weeks later. Now Marvel is taking another step forward in the right direction. This time with Iron Man. 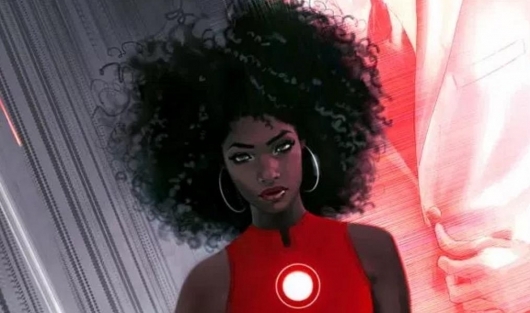 In a recent interview, Brian Michael Bendis said the mantle of the Iron Man name will be going to a 15-year-old black girl named Riri Williams. More on the story below. Superhero films can be a dime a dozen, especially since a lot of them come out every other if not every month of the year. So it would be hard for one to make an everlasting impression on anyone, let alone someone like Steven Spielberg. Now, the legendary filmmaker, who is at the Cannes Film Festival to help promote is upcoming film, The BFG – check out the new trailer here – is talking about which superhero films are his favorite. And don’t worry, he is not a part of the conspiracy, as his list is a pretty nice mix from Marvel and DC. Check out which of the superhero films are his favorite below. At first, the idea of Iron Man 4 it started out as a slip of the tongue when Robert Downey Jr. said he would be interested in the film. This was then quickly clarified with the actor backtracking on the statement. It had been reported that the actor would only be contracted for a few more films, particularly the Avengers sequels. 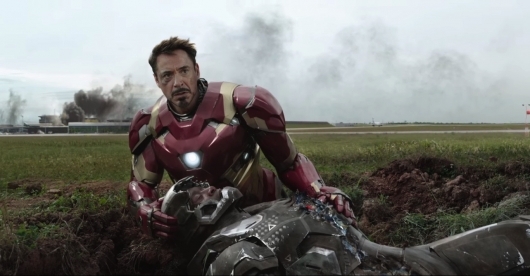 However, that all changed when it was announced that Iron Man would have a major role in Captain America: Civil War. Some thought that the film could be mistaken for Iron Man 4, to which Downey Jr. assured that Civil War would be Captain America’s film. He went on to say that Iron Man 4 is definitely not on the table. Then the actor signed on to be in Spider-Man: Homecoming, something that had been speculated for a long time. Now it is looking more like Iron Man 4 may actually happen. Emphasis on may. More on the story below. Team Captain America and Team Iron Man are set to go head to head when Captain America: Civil War is released early next month, but in true pro wrestling style, the stars behind the two team captains, Chris Evans and Robert Downey Jr., couldn’t wait that long to throw down. 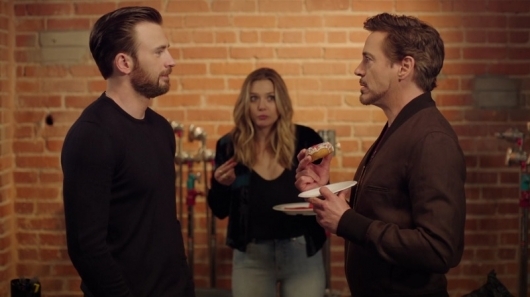 A new video of the two actors meeting face to face has been released by People, and in it tempers flare when Downey Jr. does the unthinkable: takes the last donut (with red, white, and blue sprinkles). Poor Scarlet Witch (Elizabeth Olsen) can only look on in horror as she gets deer in headlighted by the confrontation. Captain America: Civil War is as advertised. It’s a Captain America movie, despite the film having A-list heroes who had their own films in the past like Iron Man and Spider-Man – and in the future, Black Panther. There have been some rumblings of an Iron Man 4 being in the cards after Robert Downey Jr. had renegotiated his contract with Marvel. 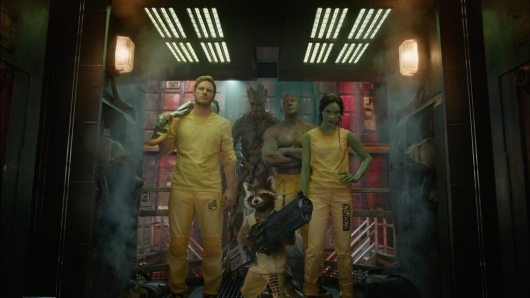 Downey Jr. and Gwyneth Paltrow both said it was very unlikely that the sequel would happen. Still, there are fans who are hoping that it will happen, and some might go as far as to look at Captain America: Civil War as Iron Man 4. So now the actor has gone on record to clarify the matter. Check out what he had to say below.